As Pete Buttigieg‘s profile rose to a legit Democratic contender for president, many waited to see how the Christian right would respond to a married gay man seeking the highest office of the land. Now, we’re getting a look at how things are going to play out, and it’s just as ugly as anyone expected. From within the message machine of the Christian right, the narrative is clear: Buttigieg’s life as a proud gay man is a threat to the religious liberty of bible-believing Christians, and he shouldn’t be allowed to become president. Holy God, we pray for this misguided soul who unashamedly calls good “evil” and evil “good.” Protect those who hear this “blind guide” from following him into the ditch spiritually and politically. Reveal yourself to him in an unmistakable way to the end that he can no longer worship the god of his imagination but worship you in Spirit and in truth. 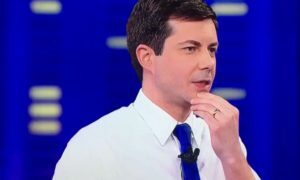 In an op-ed for OneNewsNow, Fischer argued that liberals who criticize Donald Trump‘s “sexual romps” that took place “12 or 13 years ago” are hypocrites for supporting Buttigieg at the same time. “This means, of course, that unless they are profoundly hypocritical, regressives will be able to understand our legitimate concerns about Buttigieg’s aberrant sexual conduct and what it means for his qualifications to become the leader of the Free World,” Fischer writes. “This bill is the single greatest direct threat to the America established by the Founders,” he declared. The attack on Buttigieg from the far-right was likely exacerbated by his public criticisms of Vice President Mike Pence, which prompted a week-long back-and-forth between the two. 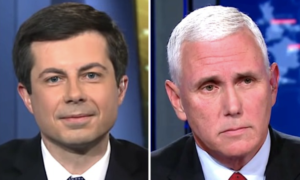 In different interviews, Pence said he worked closely with Buttigieg, who is the mayor of South Bend, Indiana, when he was governor of the state. Pence even called him “a friend.” Buttigieg said he’s “not interested in feuding” with Pence and is just pointing out his discriminatory policies against the LGBTQ community. 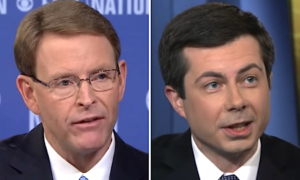 Nevertheless, Buttigieg has mentioned Pence numerous times, which prompted Pence, and other evangelicals, to accuse Buttigieg of an unprovoked attack on Christians. During an appearance on the Ellen show this week, Buttigieg clarified his motives. That’s likely not going to convince the Bryan Fischers of the world.